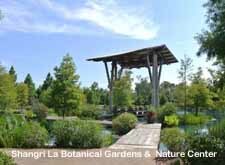 Shangri La Botanical Gardens and Nature Center is one of the Nelda C. and H.J. Stark Foundation’s four cultural venues in Orange, Texas. Shangri La’s 252-acre site presents a unique combination of formal gardens and natural environment, including the Orientation Center, Exhibit Hall, Discovery Theatre, Classroom Greenhouse, a café and Garden Store. The ecosystem of Shangri La has been recognized for its uniqueness—an undeveloped cypress tupelo swamp in the middle of an urban area. The American Institute of Architects selected Shangri La as one of the “Top Ten Green Projects” in the world. The candidate we sought had to be an accomplished horticulturalist with proven leadership skills, preferably with a PhD in a relevant discipline. Excellent community relations, writing and speaking skills were also required. In addition, the successful candidate had to have the usual directorial skills of managing people and finances and working with a Board. Last but not least, she/he had to value the life style the Gulf Coast of Southeast Texas would provide. In consultation with the Search Committee we drafted the ideal candidate profile and proceeded with a search strategy that included combing our database of several thousand individuals and doing fresh research to develop a list of people targeted for recruiting and for sourcing. We also advertised on relevant websites. Our efforts, along with Shangri La’s reputation in the botanical garden field, created significant interest in the position. Among the qualified candidates we and the Search Committee interviewed, one stood out. He was Dr. Rick Lewandowski, whose work at the Mount Cuba Center in Maryland and nationwide reputation as a horticultural expert, lecturer and writer were well known and respected in the field. We recently spoke with the Stark Foundation leadership and they assured us that Rick’s experience and personal characteristics were the perfect fit at Shangri La.